Redemptorists share in the mission of the Universal Church, which is the same mission as that of Jesus, the Redeemer, entrusted to Him by the Father. This mission is carried out in solidarity with the poor. Thus, working to promote the values of Justice, Peace and the Integrity of Creation is an expression of who we are and not only of something we do marginally to our mission. The commitment to the poor and the promotion of justice are intrinsically linked to our mission. Our Constitutions establish that the mission of the Congregation is characterized by service to persons, especially those who, because of social conditions, are the poorest and most in need (Cfr. Const. 14). This mission “includes the liberation and salvation of the whole human person,” which leads all Redemptorists to “show solidarity with the poor by promoting their fundamental rights to justice and freedom.” (Cf. Cont. 5). Following the example of Christ, in his dedication to all those oppressed by sin and all its expressions, the Redemptorists make the option for the poor their very reason for being in the Church (Cf. Const. 5). Our mission, above all, consists in the proclamation of Jesus Christ, in solidarity with the poor, and the liberator of every structure of death; a proclamation of the Good News that is also reflected in our lifestyle. The XXV General Chapter invites us once again to direct our gaze towards those fundamental elements of our Redemptorist being, especially in terms of solidarity and assuming a life that corresponds to the option with the poor (Final message, n.18). The Synod of Bishops on Justice in the World declares that “action on behalf of justice and the participation in the transformation of the world fully appear to us as a constitutive dimension of the preaching of the Gospel ” (1971, n.6). Hence, evangelization and mission without the perspectives of the values of Justice, Peace and the Integration of Creation cannot be called authentic. Thus, the Commission for Social Ministry, Justice, Peace and the Integration of Creation (SM-JPIC), as part of the General Secretariat for Evangelization and as this Secretariat responds to the tasks received from the General Government, promotes and encourages actions, at the level of the whole Congregation, in the fields of: human mobility, justice and peace, volunteering, integration of creation, inter-religious dialogue and prison ministry. • the fostering of social analysis, theological reflection and biblical foundations to the process that directs our charism to action. • the channeling of the voices of the poor and oppressed (those of our confreres among these voices), establishing links of communication between the General government, institutions and NGOs – with the purpose of offering alternatives to their sufferings. • the accompaniment of the Congregation’s Conferences and Units in identifying their particular lifestyle and the promotion of the values of the PS-JPIC. • the promoting of the integration of prophetic actions within local apostolic projects, at the level of Congregational Units and conferences. • the collection and establishment of communication networks between Units, Conferences and Institutions outside of the Congregation, which can help us to create awareness and strengthen initiatives related to JPIC. • the providing our communities with the resources and tools to combat the scourges that undermine the dignity of the human person and of the harmony of creation, in the different regions where the Congregation is present. • the promoting of communication and cooperation networks with entities and associations that work with JPIC, especially with groups of religious men and women that promote JPIC, the Pontifical Council for Justice and Peace, Caritas Internationalis, Documentation and Study Service (SEDOS), NGOs of Catholic and Redemptorist inspiration, Embassies, the United Nations, etc. • the supporting of the work of the Solidarity Office for Africa and Madagascar. 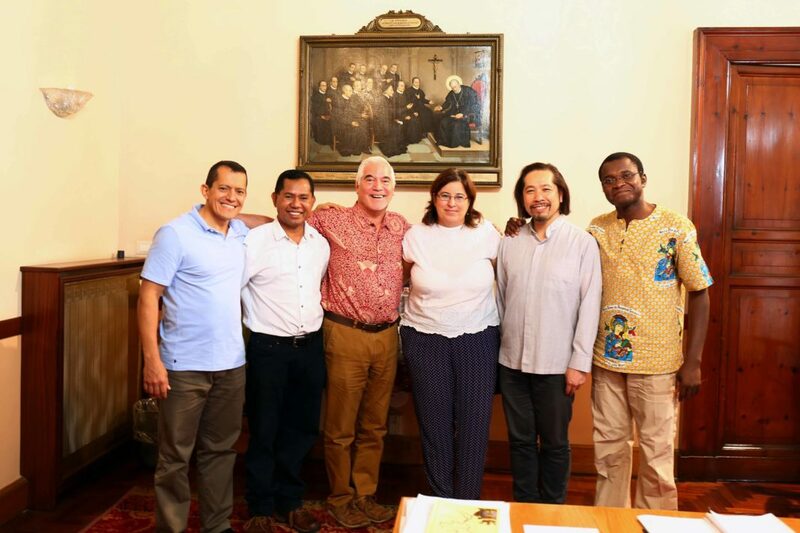 • the supporting of the Brothers and Sisters of the Redemptorist family committed to justice and peace and who put the integrity of their lives at risk by favoring the dignity of the human person and of creation. • the searching of a better approach to issues and concerns common to all the inhabitants of our Common House, such as care for the environment, discrimination against women and multiculturalism. The SM-JPRC is an integrating force at all fronts: mission, preaching, education, sanctuaries, etc. It is also a force that connects us all, as individuals and as a Congregation. The challenges of the mission in a globalized world today demand that we think and act as a single missionary body. Once the common challenges of the process of discerning apostolic priorities have been identified, we must be sensitive to and appreciate the need for common responses, regardless of the apostolic sector in which we find ourselves. The SM-JPRC Commission intends to support these processes and contribute to the articulation and socialization of these efforts.